Nissan is launching what it calls the Easy Fill Tire Alert system, an sensitive feature that handles the whole thing about tire pressure save for actually putting the air in. Newer cars have different types of sensor systems that let you know when you need to put in air, but they can be particular and unspecific. 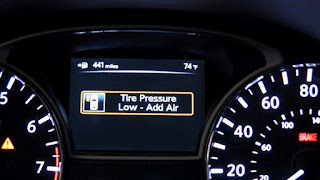 The Nissan Easy Fill Tire Alert takes sensor-based pressure monitoring to a new level of convenience. The Easy Fill system also serves as a digital gauge when filling your tires. Instead of dealing with cold pressure measurements and those annoying pressure gauges attached to the gas station pump, you can simply start pumping. The car's lights will flash to let you know that air is going into the tire, and the car will sound the horn when you've reached pressure. Keeping your tires at pressure will give you safer, more efficient performance from your car. The Easy Fill Tire System will be unveiling on the 2013 Altima and will be standard equipment on all 2013 models.